Well nearly. Possibly as close as we might get. If you have followed the Spherical Nucleic Acid / SmartFlare / StickyFlare story on this blog, you will know that we have raised doubts about the endosomal escape of these nanoparticles which are supposed to reach the cytosol of cells where they could detect mRNAs. We have even published an article on this topic. The Mirkin group has developed the technology and it has been commercialized four years ago for the live cell detection of mRNAs by EMD Millipore. One PNAS paper on the topic was Briley et al (see here for letter to PNAS and what happened to that letter). In his PhD dissertation (Briley, W. E. (2016), William Edward Briley respond to our criticism. I reproduce the relevant section below. One might note that there is an incredibly simple way to determine the localisation of these particles inside the cells: electron microscopy, a technique which has been used for this exact purpose for over 50 years. We have used it. The results were unambiguous. Though the endosomal escape of SNA nanostructures such as the Nanoflare and stickyflare is evident based upon their ability to provide sequence-specific information regarding RNA levels and locations within cells, one researcher has concluded that SNAs cannot escape from endosomes. That researcher [That’s me!] is ignoring the many papers now that use such architectures for sequence-specific cell-sorting experiments. Indeed, if these architectures, which are taken up by scavenger-receptor mediated endosomal pathways,[68a] do not escape the endosome, then it is difficult to understand the reports by the many groups who have documented the sequencespecific function of SNAs (all of which require endosomal escape), in antisense gene regulation,[12, 44-45, 53] siRNA gene regulation,[20, 68b, 76] nanoflare gene detection,[47, 67a, 67c, 77] and sticky-flare gene detection. Perhaps the best demonstration of this sequence specificity is in the function of the multiplexed Nanoflare. [67a] This nanoconjugate, discussed in chapter 1, contains two targeting sequences specific to two different genes (actin and survivin). When cells treated with multiplexed nanoflares were subjected to siRNA that specifically knocked down the expression of survivin, a corresponding decrease of fluorescence was observed in the nanoflare’s survivin-associated fluorescence (cy5), but not the actin-associated fluorescence (cy3) compared to control. [67a] Likewise, when cells were subjected to actin-targeting siRNA, a decrease in actin-associated fluorescence was observed, with no decrease of survivin-associated fluorescence. These results indicate that the detection by nanoflares is unique to the targeted mRNA transcript. To rule out any possible effects of the fluorophores, the Cy5 and Cy3 dyes were switched to the other gene (actin-cy5, survivin-cy3), and again the corresponding sequence-specific responses were observed. Importantly, since the development of the multiplexed nanoflare, other research groups have independently developed nanoflare-like structures capable of sequence-specific detection of 3, and even 4 genes simultaneously. Additionally, since the commercialization and sale of the nanoflare platform under the trade name Smartflare (Millipore), dozens of researchers around the world have participated in successful sequence-specific gene detection. has also been identified by other groups, using multiple techniques, in HeLa cells. Sticky-flare release from the endosome was further confirmed by designing sticky-flares targeting a second sequence, a U1 short nuclear RNA (snRNA). U1 snRNA is known to traffic from the cytoplasm to the nucleus. Indeed, cells treated with U1-targeting sticky-flares exhibited specific fluorescence within the nucleus. The pattern observed indicates nuclear localization through endosomal escape and sequence-specific tagging of an RNA that is actively transported into the nucleus. Again, this would not be possible if such structures were confined exclusively to endosomes. 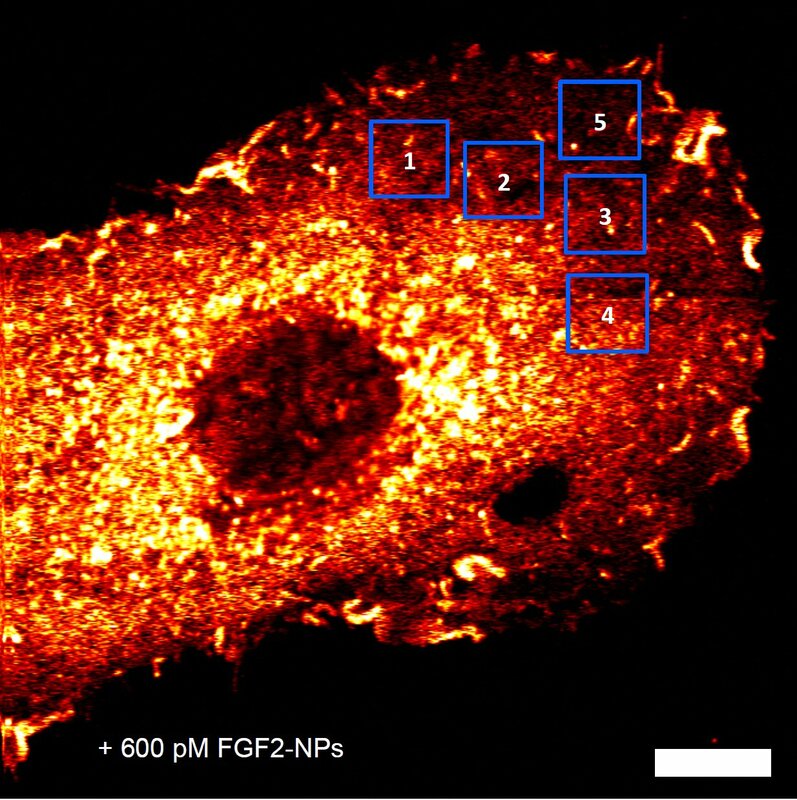 Speculation that SNAs do not escape endosomes has been fueled by the observation that the fluorescence pattern of β-actin in MEFs is punctate, which has been interpreted as an indication that the sticky-flares are simply trapped in endosomes. 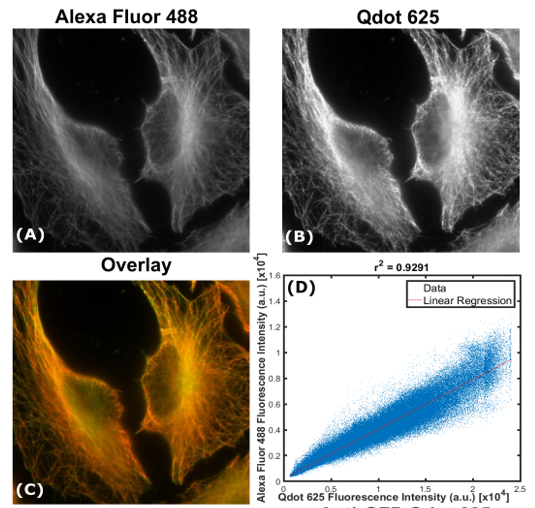 However, β-actin is well known to exhibit punctate fluorescence in many cases, an observation made by others in multiple cell lines, including MEFs. Punctate fluorescence is very common in RNA-labeling studies and well known by researchers familiar with FISH.82 This is due to the fact that RNA is often packaged into large RNA-containing granules, which facilitates transport and translational control of the included transcripts. [82b, 83] Such packaging into granules has been extensively studied using β-actin mRNA. Thus, the fact that sticky-flares targeting β-actin were packaged into granules as previously observed, while U1-targeting sticky-flares were specific to the nucleus in the same cell line, demonstrates the functionality of the construct. Taken together, the success of the many groups who use flare architectures for the detection and knockdown of RNA in cells, and the work of dozens of labs studying related nanoparticle constructs, provide unambiguous evidence of the ability for such architectures to escape the endosome and participate in reactions exclusive to the cytosol. The mechanism of endosomal escape for nanoparticle-based vehicles is currently unknown and is an interesting and important question that is actively being investigated by many in the field. Figure 3 from doi:10.3762/bjnano.8.125 shows Tubulin simultaneously labelled with small fluorescent dye (A) and QDots (B). Overlay shows Qdot in green and A488 in Magenta. See paper for more details. See UPDATE below. UPDATE [2017-06-13]: in response to a comment below, I’ve updated the overlay figure to use green/magenta instead of green/red. The original figure can be seen in the paper or here. This is a guest post by Dan Nieves, who was until recently a joint member of Raphael and Dave’s labs. 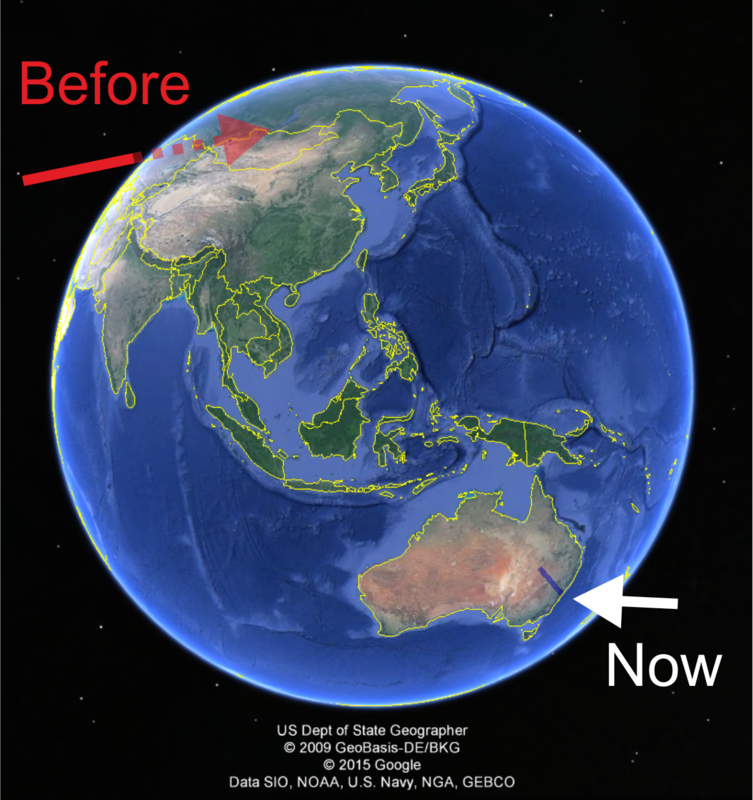 Dan has moved as far as he could go from us: he is now residing in Sydney at the EMBL Australia node for Single Molecule Science at the University of New South Wales. Today, our paper from my time at Liverpool “Photothermal Raster Image Correlation Spectroscopy (PhRICS) of gold nanoparticles in solution and on live cells” was published in the new Royal Society open-access journal, Royal Society Open Science. This journal is committed to an open peer-review system, thus, the review history and referees comments are viewable alongside the article, and also post publication peer-review in the form of a comments section below the paper is facilitated. Additionally, the data that supports the conclusions of the paper are (and have to be) readily accessible (here at Figshare). This is exciting, as not only are the discussions between authors and referees are available to everyone, but you can also join in the discussion fully after publication with access to the primary data. Therefore, the critical evaluation/re-evaluation of the work is totally encouraged and should never stop! Our paper describes the development of an extension of photothermal heterodyne imaging; a technique used to detect and image single gold nanoparticles much smaller than the diffraction limit at high signal to noise via scattering induced by laser light absorption (nice explanation here). The extension employs fast raster-scan imaging of the sample in which fluctuations, or “streaks” (top panels, Fig.1), are observed due to the movement of nanoparticles through the detection volume during the scan. From these fluctuations it is possible to extract how fast the nanoparticles are moving from the application of image correlation analyses. 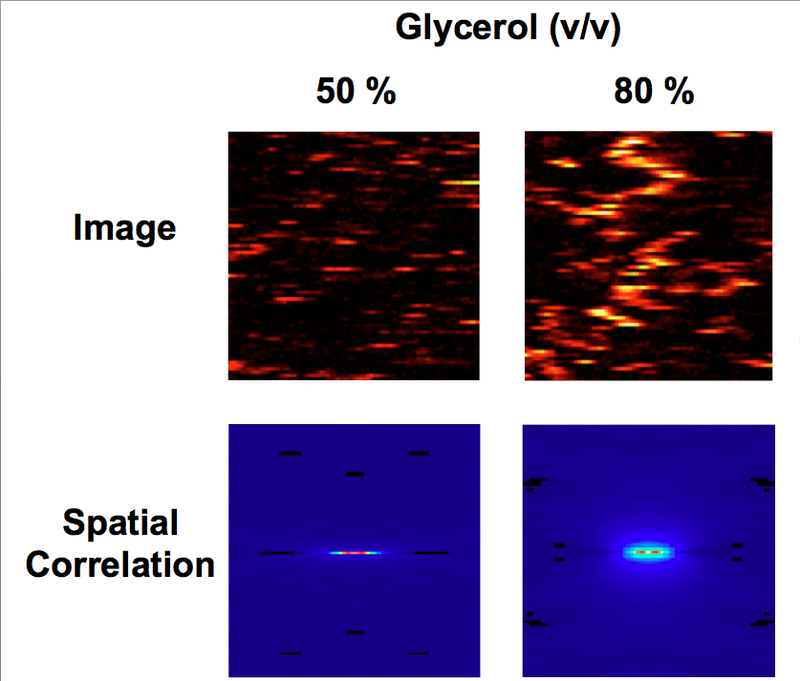 In our particular case, we applied the raster image correlation spectroscopy (RICS) method, developed in the lab of Enrico Gratton (original paper here). Briefly, after acquiring many raster scan images; the images are then spatially correlated with themselves by shifting the image pixel by pixel in all directions (x and y in this case) and calculating the correlation function. This means repeating fluctuations within the image, i.e., nanoparticle diffusion, will be reflected in the time it takes for the spatial correlation to decay, for example, the spatial correlations for movement of slow moving objects decays quite differently to that of fast moving objects (lower panels, Fig.1). From the spatial correlations the diffusion behavior, such as the diffusion coefficient, can be extracted. In our case, I applied the analysis to photothermal images of 8.8nm gold nanoparticles diffusing in solutions of different viscosity to verify the PhRICS approach (Fig.1). Here, we were able to extract the diffusion coefficients of the nanoparticles in the different solutions. The advantage of this approach compared to the current photothermal heterodyne techniques for probing diffusion (photothermal tracking and absorption correlation spectroscopy) is that not only can we acquire rapidly information on fast diffusion dynamics, but we can also observe the distribution of nanoparticles over the relatively large area of the image (≈ 40 μm2). Fig.1 – Example of gold nanoparticle diffusion in solutions of different viscosity (top panel) with the corresponding spatial correlations (bottom panel). We then turned our attention to the use of the technique to observe the diffusion of fibroblast growth factors labelled with gold nanoparticles on live cells. FGFs are involved in a wide range of essential biological processes from the formation of morphogen gradients and signalling to homeostatic control of glucose and phosphate levels. Here, 8.8 nm gold nanoparticles were used to covalently label single fibroblast growth factor 2 proteins (FGF2-NP: via this method), and then incubated with live rat mammary fibroblast cells (Fig.2). It was observed previously in our lab that there is significant heterogeneity in FGF2 distribution and diffusion in the pericellular matrix when bound to heparan sulphate. We found the diffusion coefficient of the FGF2-NP could be extracted, and that diffusion measurements were variable depending on the area imaged. Additionally, it is apparent that the image data contained much more information than we could extract using the simple diffusion model applied. The observation of the formation and dissolution of intense peaks within the images, added to the 2D-movement of such peaks from image to image (see Movie1), gives more insight into the dynamic long range restructuring of the pericellular matrix of live cells at “short” (μs and ms) and “longer” (secs and mins) timescales. Fig.2 – Photothermal image of rat mammary fibroblast incubated with 600 pM of FGF2-NP. Blue boxes indicate the areas where PhRICS imaging was performed on the cell. The paper is now available at the Royal Society Open Science , and if your interest has been piqued thus far, I strongly encourage you check the paper out. Better still would be for you to engage in the post-publication comments section should you have any questions, comments or suggestions. Earlier, I reported on the publication of our article on the internalisation of peptide-capped nanoparticles in cells. Today, I want to share with you the publication process as it happened at PloS One. The paper was submitted on the 20th of November 2014. The academic editor sent his decision, major revision, along with two referees reports on the 22nd of December, i.e. one month after submission [great turn around time!]. Reviewer 2 was very supportive but reviewer 1 much less so: there appeared to be a real difference of interpretation regarding the impact of cell-penetrating peptides on the intracellular localisation of ingested nanoparticles. The reviewer also requested additional experiments that we could not easily do at this time and that we felt were unnecessary to support our main conclusions. The academic editor himself, Dr Pedro V. Baptista [more on PloS One editorial process here], was author on a paper which in some ways could be seen as conflicting with our results and interpretation. The response to the referees and editors took me a long time to write. It was submitted on the 29th of January. I share it below. The paper was accepted on the 6th of February. I welcome this decision, not just because our paper gets published -this is of course also great news!-, but because it demonstrates that there is space for open scientific debate in the peer reviewed literature. For this, I am immensely grateful to Dr Baptista. On behalf of my co-authors, I would like to thank you for handling our article and to thank the reviewers for their careful reading and for their comments. Reviewer 2 notes that the context of our ms is the existence of conflicting reports on the effect of TAT and HA2 on intracellular fate of nanoparticles. Indeed, some articles have reported efficient access to the cytosol, while other studies indicate that most particles remain confined in endosomal compartments. Our own experiments are in line with this second group of articles. Reviewer 2 notes that “the study is well designed and executed and the results are interpreted appropriately”. Reviewer 2 supports publication in its current form. Experiments related to this topic have led to many articles in the past 10 years. However, the persistence of conflicting reports and the importance of the topic for many envisioned applications require new insights. This we have provided through the use of imaging modalities that provide information across different scales: electron microscopy measures what occurs to a few nanoparticles in a very small part of the cell; photothermal microscopy measures what happens to the bulk of nanoparticles across a large part of the cell. This combination is thus uniquely able to address, in at least one cell type and a particular formulation of nanoparticle, the fate of TAT-functionalised nanoparticles after they bind to the cell surface. Below we respond to the detailed queries of reviewer 1 and trust that the manuscript now meets the standards required for publication in PLOS One. • Novelty. Our article is a significant piece of work that adds useful information towards understanding and clarifying the impact of cell penetrating peptides on intracellular localisation of nanoparticles. The work is novel because it builds on a new imaging methodology that directly images the nanoparticle cores (as opposed to an attached fluorescent molecule) and gives a better overview of an entire cell than just electron microscopy. It is also novel because our peptide self-assembled monolayer approach enables us to do systematic variations of the surface chemistry of the nanoconjugates. • “To include the images and quantification in Figure 1 with cells only with naked gold nanoparticles and cells only with PEG-gold nanoparticles and compare intensities.” The images and quantification for “cells only” were already included (Fig. 1A and first column of Fig. 1F). We have not included “naked gold”. Instead, as a reference point, we have used PEG-gold particles that have a capping composition made of CALNN and CCALNN-PEG. “naked gold” does not remain naked: non-specific adsorption of proteins, e.g. serum albumin in the cell medium, very rapidly changes the properties of the surface [see for example, Time Evolution of the Nanoparticle Protein Corona, Casals et al., ACS Nano, 2010, 4, pp 3623–3632]. The CALNN and CCALNNPEG composition was optimised, as discussed p 7, line 213-220 and Fig. S2 “Gold nanoparticles uptake decreases with increasing percentages of CCALNN-PEG”. The selected composition leads to minimal uptake as shown in Fig. 1B and the second column in Fig. 1F. From this reference composition, we have made systematic variations where we include defined percentages of the two functional peptides (dHA2 and TAT). For all these conditions, exemplary images are shown in Fig. 1 A-E, additional images are shared via figshare (http://dx.doi.org/10.6084/m9.figshare.1088379) and the quantifications are shown in Fig. 1F. • “To perform other technique to quantify the gold content […].To include more time points in the TEM studies […]. […] the efficacy results reported by the authors are premature without the additional data described above.” While we agree that the suggested experiments are interesting, they are not necessary to reach the conclusions arrived at in the ms. Those conclusions do not concern “efficacy”, but increased uptake and intracellular localisation. The increase in photothermal signal as well as in the counts of nanoparticles in EM images unambiguously demonstrate increased uptake. The non-homogenous distribution of signal observed in the photothermal images and the electron microscopy analyses unambiguously rule out cytosolic distribution of the nanoparticles. The time point of 3 hours used in our studies is a key point both from the perspective of applications and of cell entry mechanisms. We agree that a systematic analysis as a function of time after uptake would provide further insights into endocytotic mechanisms, but it is outside of the focus of this study. Furthermore, it has been done extensively by cell biologists since the 1950s using a variety of probes. Notably, one of the first applications of gold nanoparticles in biology precisely focused on the mechanisms by which cells probe their external environment (Electron microscopy of HeLa cells after ingestion of colloidal gold, Harford et al., J Biophys Biochem Cytol 1957 3:749-756; reference added into the ms). microscopy images. The photothermal imaging provides a unique means for the reader to understand nanoparticle distribution over biologically representative scales. Importantly, we are sharing here 942 EM images and 37 photothermal images. By publishing all of our data alongside the study , we enable other scientists to check and challenge our conclusions and propose alternative hypotheses. PLoS One is a particularly good forum for our article because of its commenting platform where this discussion can continue in the open after the publication of the article. This post is co-authored by Raphaël Lévy and Dave Mason. Note: We contacted Chad Mirkin and EMD Millipore for comments. Chad Mirkin replied but did not allow me to share his comments as he prefers to discuss his work in peer reviewed manuscripts rather than blogs. EMD Millipore has provided a response (reproduced below) and is keen to further engage in the discussion. They wrote that they “look forward to responding to [the questions you pose at the end of the post] after your blog is posted so other researchers who may have the same questions can follow our discussion online.” [Update: they have gone into silent mode after that comment]. Update: The results of our study have now been published. To image proteins in cells, biologists have powerful tools based on the Green Fluorescent Protein (GFP) for which Osamu Shimomura, Martin Chalfie and Roger Y. Tsien obtained the 2008 Nobel Prize in Chemistry. RNA molecules play crucial roles in cells such as coding, decoding, regulation, and expression of genes, yet they are much more difficult to study. SmartFlares are nanoparticle-based probes for the detection and imaging of RNA in live cells. Could they become the GFP of the RNA world? For a molecular sensor to work, it needs a detection mechanism. The principle of the SmartFlare is explained from 0:45. A capture oligonucleotide (i.e. DNA) is bound to the gold nanoparticles. A reporter strand is bound to the capture strand. The reporter strand carries a fluorophore but that fluorophore does not emit light because it is too close to the gold (the fluorescence is “quenched”). In the presence of the target RNA, the reporter strand is replaced by the target RNA and therefore released, quenching stops, and fluorescence is detected. The release is shown at 2:05. Simple and convincing. Gold nanoparticles are indeed excellent fluorescence quenchers (we have used this property in a couple of papers). But, for a molecular sensor to work, it also needs to reach the molecule it is supposed to detect. The SmartFlares are shown at 1:40 entering the cells via endocytosis, a normal mechanism by which the cell engulfs extracellular material by entrapping them into a bag made of cell membrane. Molecules and particles which enter the cell by endocytosis normally remain trapped in this bag. This entrapping is essential to protect us from viruses and bacteria by preventing them from accessing the cell machinery. Here, however, at 1:45 – 1:46, something truly remarkable happens: the endosome (the bag) suddenly fades away leaving the particles free to diffuse in the cell and meet their RNA targets. This is a promotional video so you might say that the demonstration of, and explanation for, this remarkable endosomal escape is to be found in the primary literature but that is not the case. There is an extensive body of literature (not related to SmartFlare) dealing with endosomal escape. Some bacteria (like Listeria which can cause food poisoning) and viruses (like Influenza or HIV) use proteins to destabilise the endosome, escape and cause disease. Other mechanisms involve altering the ion balance in the endosome to pop it like an over-inflated balloon (you can read more about the ‘Proton Sponge Effect’ in this review). The problem is that none of these scenarios are applicable to gold nanoparticles conjugated to oligonucleotides. The problem is compounded by the choice of techniques used to analyse SmartFlare uptake into cells. Most of the published papers (for examples see here, here and here) characterise “uptake” and do so largely via Flow Cytometry or Mass Spectrometry (to measure the gold content of the cells). These papers certainly support NanoFlares being taken up into endosomes, but don’t offer any evidence for endosomal escape. A systematic unbiased electron microscopy study would enable to gather an estimate of how many nanoparticles have escaped the endosomes. Alternatively, fluorescence microscopy can be used to visualise a diffuse (released) instead of punctate (still in endosomes) distribution of intensity. While there are some images of cells having taken up NanoFlares, the sort of resolution required to discern distribution is not afforded by publication-size figures. Wouldn’t it be nice if we had access to the original data? Researchers are often left squinting at published figures and all too often have to rely on the author’s interpretation of the data. One solution to this problem is to make supporting data available after publication. This is the idea behind the JCB Dataviewer; allowing authors to upload the original data to support papers published in the Journal of Cell Biology. The other option is to make the data available before publication, in what is called Open Research. This has the huge advantage of opening up a discussion about data, its interpretation and meaning before going through the formal peer-review process. Following the manufacturer’s usage and loading protocol, after 18h fluorescence is seen in cells exposed to VEGF SmartFlares. Fluorescence is also seen however, in the uptake control (fluorophore-conjugated gold nanoparticles) and scrambled control (a nonsense hybridisation sequence). Treating the cells with DMOG, a compound known to increase VEGF RNA levels in the cells, doesn’t have any effect on the fluorescent intensity or distribution (scroll about half way down the results). In all conditions where fluorescence is seen, the distribution is consistently punctate (see all of the data here ). Why do we see punctate fluorescence with the VEGF SmartFlares? If the SmartFlares are still in endosomes, they shouldn’t be able to interact with mRNA and thus fluorescence should be quenched. Why do we see signal at all in the scrambled control? Why do different cells take up varying amounts of SmartFlares? Fluid phase dextran shows approximately equal uptake in all cells. We’re presently investigating these and other questions. As we find out more, we will continue to post the data and update the blog. · Therefore, with regards to the experiment you’ve already performed, our first suggestion would be to turn up the gain to see cytoplasmic fluorescence. It may be worth noting some of our more recent examples of SmartFlare in the literature, spanning across cancer and stem cell research on a variety of detection platforms (flow & microscopy). Here the punctate fluorescence is also observed, but you can also see nice cytoplasmic staining. That is the title of Bogart et al Nano Focus article published yesterday in ACS Nano. 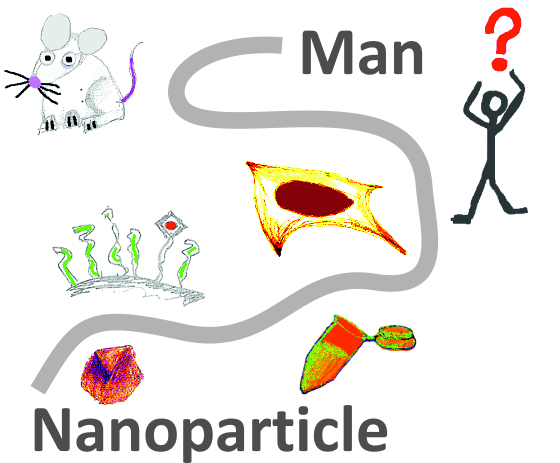 Nanoparticles have the potential to contribute to new modalities in molecular imaging and sensing as well as in therapeutic interventions. In this Nano Focus article, we identify some of the current challenges and knowledge gaps that need to be confronted to accelerate the developments of various applications. Using specific examples, we journey from the characterization of these complex hybrid nanomaterials; continue with surface design and (bio)physicochemical properties, their fate in biological media and cells, and their potential for cancer treatment; and finally reflect on the role of animal models to predict their behavior in humans. The first discussions about this paper took place during the European Materials Research Society meeting in Strasbourg last year (where several of the authors co-chaired symposium Q).